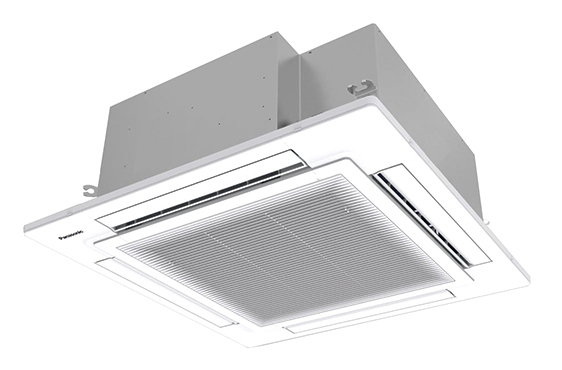 Panasonic’s latest generation of ceiling-mounted PACi and ECOi 90×90 indoor cassette units have been developed to satisfy customer demands for an air conditioning system that provides energy savings, maximum comfort and healthier air. Panasonic’s 90×90 indoor cassette unit boasts exceptionally efficient performance. The SCOP and SEER values have increased by 15% over the previous generation, making these units more efficient than ever before. When operating at 10kW, the unit has an A++ SEER value of 7.60, and an A++ SCOP rating of 4.80. The intelligent ECONAVI sensor technology is a key feature of the new 90×90 cassette, as it enables the unit to save energy and provide a healthier environment. The ECONAVI system includes two sensors, one focussing on movement, and the other targeting floor temperatures. When the movement sensor detects that no one is present, it reduces the air conditioning output to save energy. Then, when the sensor identifies that people have entered the environment, it increases output of the cassette unit to provide the most comfortable temperature for those present. The floor temperature sensor detects whether people are present by motion up to 5m in height. The sensor enables the unit to detect average floor temperatures and operate in circulation mode if the temperature is too low. 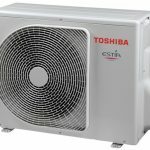 A new humidity sensor monitors and controls the amount of moisture in the environment, preventing the air from becoming too humid or too dry. The nanoe purification system within the cassette unit ensures that the air that is emitted from the unit is clean and fresh. 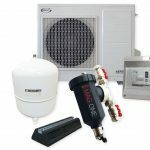 The nanoe system can work simultaneously with the heating and cooling operation of the system to remove bacteria and other airborne particles from the air before it enters a room. The Nanoe filtration system removes pollen, pollution and fungi from the air intake to create a healthier, more comfortable environment for users. The Panasonic 90×90 indoor cassette units have been significantly redesigned to feature a flat panel design, providing the unit a more subtle profile so that it can be seamlessly integrated into any interior design scheme. The unit can also be operated with a variety of Panasonic controllers, including the CZ-RTC5A wired remote. This controller includes upgraded functions, including nanoe control and ECONAVI control (Direct, indirect air flow control via sensors). With its advanced energy saving capabilities, sophisticated air-filtration technology and flexibility of control, alongside its subtle profile and low noise levels, the Panasonic 90×90 cassette unit is the ideal choice for the hotel, commercial and retail market. *ECONAVI and Nanoe are available as optional accessories.